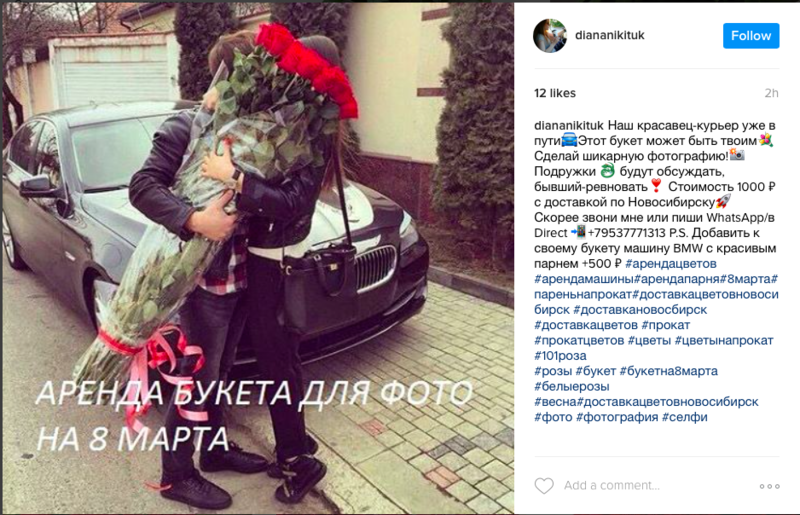 Screenshot of Instagram account @dianaiktuk offering flowers for hire. The caption reads: "Our handsome courier is already on his way. This bouquet can be yours - take a gorgeous photo! Become a topic of discussion for your girlfriends, make your ex jealous. The price including delivery in Novosibirsk is 100 rubles. Hurry up and call or place your order via WhatsApp. You can add a BMW car and a handsome man to your order for an extra 500 rubles. #flowersforrent #carforrent #boyfriendfrorent"
The Russian Iiternet has been on fire over the last few day's as some bloggers have spotted an Instagram-based business that allows people to rent bouquets of expensive flowers for ten minutes — just enough for a quick photoshoot. The prices start at 700 rubles ($12) and include the delivery of the bouquet to your flat, where you'll have it for ten minutes. Some companies, like @rosesrent, even allow you to hire their suit and tie-clad delivery men, for the appearance of a boyfriend behind the flowers — but the rules strictly note that customers are not allowed to take pictures of the men's faces. Others also offer the hire of an empty box with a designer logo from brands like Gucci and Tiffany&Co for an additional 300 rubles ($5), or a bag from TSUM, a luxury department store in Moscow, for a smaller fee of 100 robles ($1.7). Prices differ in smaller cities: for example in Novosibirsk, tge addition of an expensive car like BMW, and a man in suit and tie will cost an additional 500 rubles ($8). The account @rentroses explains the reasoning behind the service in an emoji-laden caption under a photo of a round bouquet of red roses: “Do you want to make your boyfriend jealous? Or your girl friends envious? Especially for you we will deliver a fabulous bouquet of 101 roses. After the delivery you will have ten minutes to take as many photos and selfies as you like. Rental price in Moscow is 1000 rubles including the delivery. We deliver on 6,7, 8 and 9 of March.” The dates refer to International Women's Day, which in Russia has over the time changed from a celebration of feminism to something more akin to Valentine's Day when men give their girlfriends, wives or mothers gifts and flowers. The entrepreneurial geniuses giving a new meaning to the concept of sharing economy remain anonymous, although Afisha Daily reports that they managed to interview the owner of one of the accounts offering the services, who says he got the inspiration for his new business when he saw three girls in a cafe taking selfies with the same bouquet. Most of the flower rental services offer anonymity to customers who don't want to be ousted as going a little bit too far in their imaginary boyfriend fantasies, so it is unknown whether anyone has used the companies' services yet.